Carrying out inspections for necessary repairs and maintenance of the rental property is every landlord’s responsibility. However, smart landlords go a step ahead and inspect their units to identify if the tenants are involved in any illegal activity at their rental property. Usually, people run identity and credit checks to confirm the reliability and trustworthiness of their new tenants, which is a fairly reasonable practice. But when it comes to identifying involvement of tenants in suspicious activities, many landlords fail to recognize the signs. 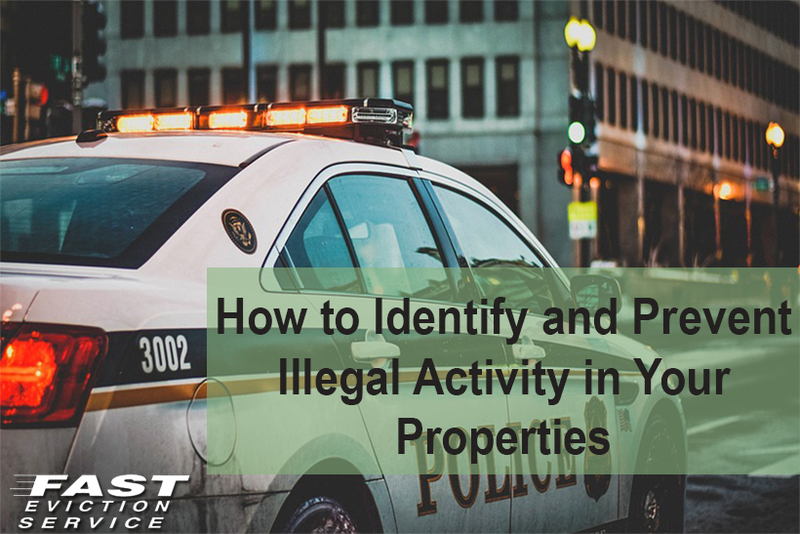 This article will introduce you the most commonly observed suspicious or illegal activities that might take place on your property, how you can identify them, what a landlord’s responsibility for criminal activity on rental property may be, and what should be done to prevent them. Drugs: Growing marijuana is quite common across privately rented properties. It is possible that drug dealers or cultivators of drug rent your property. Apart from legal and law-enforcement related troubles, such an activity is definitely not good for your property as well as it will create damages and affect the reputation and value of the rental unit. Evicting a tenant for illegal activity is the only possible solution to get rid of tenants involved in drugs cultivation, smuggling or abuse. Anti-social Behavior: The margins that define what can be categorized as anti-social behavior are extremely hard to understand. Usually this includes behaviors such as violence, verbal abuse, vandalism, harassment, rubbish dumping and threatening. Subletting: this is an issue that may or may not be counted as illegal unless it is conducted without your consent or knowledge. Sub-tenants can be a problem when you attempt to increase the rent due to their presence. Fraud: landlords need to be vigilant while assessing their prospective tenants. Checking their backgrounds thoroughly and assessing references is very important to prevent fraudsters from renting your unit. Otherwise you may become a victim of identity theft and/or fraud. Not just you but others in your neighborhood can be exploited by such individuals. Isolation: If you find your tenants mostly inside the house, windows always have curtains drawn or window glassed are tinted, tenants don’t dump their garbage for many days or there is a certain aloofness surrounding the tenants then these are signs of suspicion. Strange Smells: Usually tenants who are involved in drug dealing, cultivation or drug use on your rental property can be identified by the suspicious, unusual smells. Excessive traffic: if you observe excessive traffic frequenting your rental unit then it is time to get suspicious. Similarly sudden, excessive loitering of vehicles around or inside the property, unusual traffic patterns and people in very expensive vehicles visiting your tenants is yet another sign of drug dealing on your rental property. Moreover, if you find that frequently a vehicle is parked outside the entrance of your rental unit and the tenant comes out and communicated for a while to the people inside the vehicle, then get alerted. Criminal activity: If you feel that suddenly criminal activities have increased within your neighborhood, especially after the new tenants have moved in then get suspicious and run a full background check. Methamphetamine: you have to conduct regular inspections to identify presence of this illegal drug inside your property. Not just that it is illegal but if it is prepared by your tenants inside the rental unit then there is a risk of fire and explosion. Furthermore, the toxic waste and residues of the drug is also difficult and at times impossible to get rid of. Rental properties are quite often used as illegal meth labs, so be careful and watch out for signs of meth. Bright Lights: Please note that to grow drugs like marijuana indoors, cultivators use bright lights to accelerate their growth. Sometimes they become careless and don’t try to hide these lights and resultantly, the streets and hallways also get lit. These lights are brighter than normal residence lights and their color is similar to natural sunlight. If you observe these lights then immediately take action. Preventing Illegal or Suspicious Activities—What Can You Do? Periodic inspections: Visiting the rental unit regularly should be your first priority even if you don’t suspect any illegal activity. Remember that as per law, unannounced inspections are prohibited and if you do so then you might end up in legal trouble. So serving your tenants a Notice of Entry according to the state’s tenancy law is important. Involving law enforcement: if you are sure that your rental property has become hub of illegal activities or your tenants are involved in criminal acts, it is time to call the cops. Don’t confront them head-on because this would be dangerous. Involve law enforcement and stay in the background to avoid trouble and possible landlord responsibilities for criminal activity later on. Eviction: if you have received or witnessed clear proof of involvement of your tenants in illegal activities and/or the police have sent you a report on your tenants, think about evicting them. Start the proceedings immediately because if you don’t then somebody getting injured, abused or killed due to the tenants would create problems for you. As a landlord you may have liabilities allowing criminal activities to occur on your rental property and you will be dragged into a negligence charge and might have to pay for the damages. Expedited eviction, which requires the tenants to leave within a few days’ time, can also be applied for but it depends upon the type of illegal activity. You may need to contact the rental authority of your city/state and check out if you qualify for it or not. Ensure Property Manager is Paying Attention: if you don’t actually perform the day-to-day duties of landlord on your own and have hired property manager for these responsibilities, then you need to ensure that he/she is paying attention to suspicious activities. Whether property is managed by an individual or a team, you must make sure that they are diligent enough to identify warning signs of crime. It is true that renting a property is a very fruitful step as far as financial rewards are concerned. However, the risks are also various and wide-ranged. This is why, we recommend that property owners be alert at all times and not just perform checks prior to renting their property but also afterwards and evict tenants for illegal activity if its found.